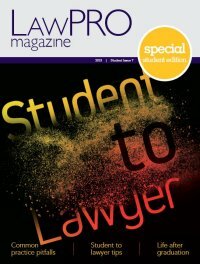 Additional LAWPRO contacts are available on the LAWPRO website. Do you need a speaker for a CPD program or law firm presentation? We can provide speakers for CPD programs and law firm presentations on a wide variety of claims prevention and law practice management topics. Please contact us if you are interested in having us present at one of your events. Dealing with a Potential Fraud? If you are an Ontario lawyer handling a matter that appears to be a fraud, please contact LAWPRO Customer Service at 1-800-410-1013 or (416) 598-5899 and ask to speak to someone on our Fraud Team. If you have suspicious emails that appear to be a bad cheque fraud or other scam, please forward them to [email protected].